Sitting on a bench in my beloved South Whidbey State Park, I was happy to be hiking again. 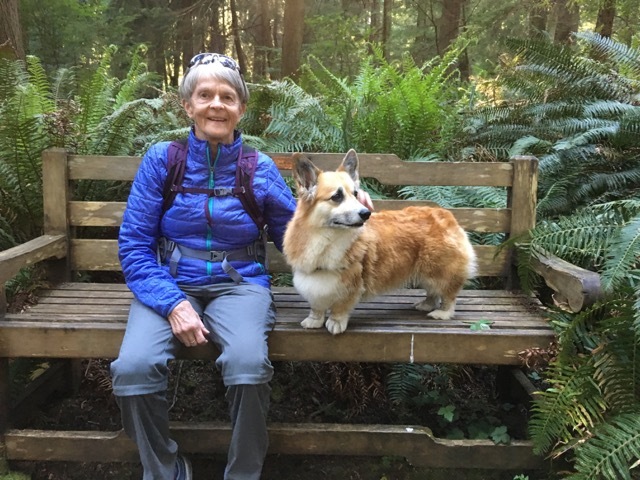 Just 3 weeks after a partial knee replacement I was not moving fast, but I was relishing the return to my weekly medicine walks. Several old growth red cedar trees towered above me. Fern and salal plants were shoulder height and dense. The sanctuary of the forest surrounded me. Within minutes of sitting there, a young family came by to admire the old cedar tree in front of me. The family paused to greet me and then the eight-year-old boy asked his father if he could go crawl into the hollowed out core of the ancient cedar tree. The father read the sign to his son, wife, and newborn. “Please stand back. This tree needs protection. 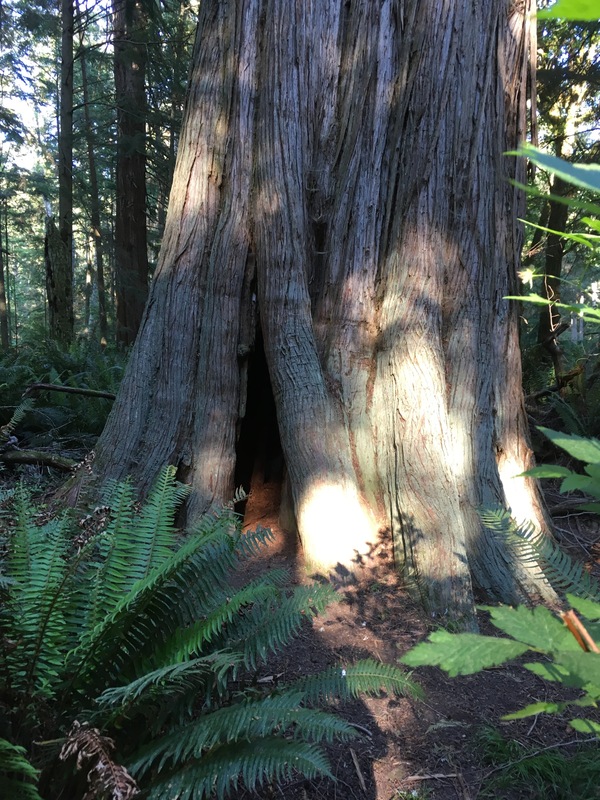 This ancient western red cedar is over 500 years old. 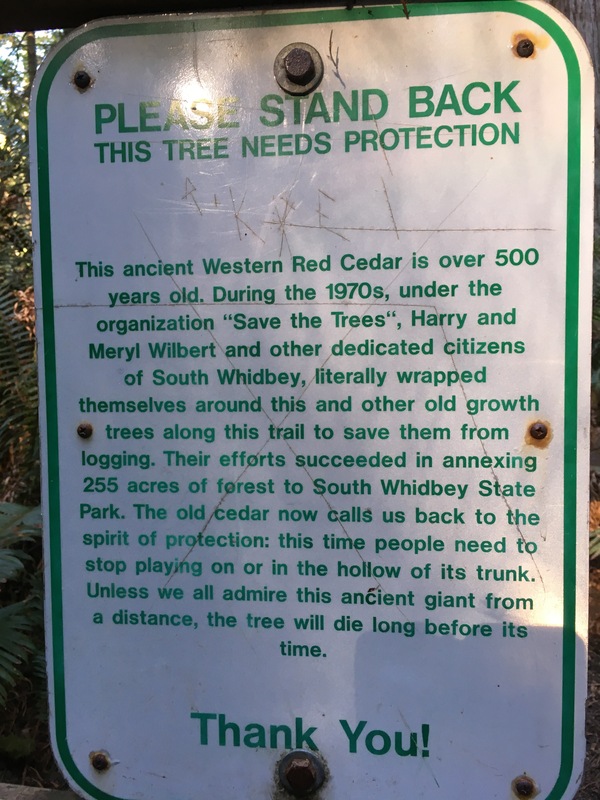 During the 1970s under the organization ‘Save the Trees’ Harry and Meryl Wilbert and other dedicated citizens of South Whidbey, literally wrapped themselves around this and other old growth trees along this trail to save them from logging. 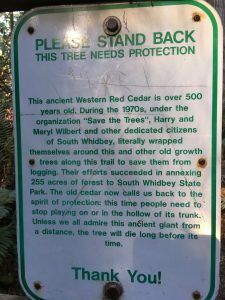 Their efforts succeeded in annexing 255 acres of forest to South Whidbey State Park. We all bid one another goodbye. After they left, I kept sitting a while longer. Nineteen years ago I was sitting in the same spot watching two young boys from the campground crawl in and out of the tree hitting the opening with sticks to make it larger. I, of course, asked them to stop. “Please don’t hurt that tree,” I had said. After they scurried away, it occurred to me that they didn’t know any better and that an educational sign might prevent further damage. 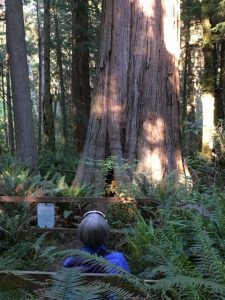 Trails and forests everywhere need stewards, and those of us who are frequent visitors can help educate newcomers in nature. A conversation here, a small action there—the natural world needs all of our attentiveness. I often have conversations with the dog owners who let their dogs run into the dunes and young people who “surf” down the fragile dunes near my home. I explain that the birds that nest in the sand frighten easily and abandon their nests and that the plants that hold the dunes together are not strong and need our help. Without those explanations people would not know. It is easy to equate ignorance with laziness. So much better to have the conversation about the rich history and spread some information. Lovely story, Ann! And blessings to that new knee, that you might walk the trail for many years more! A Bow to You, Dear Ann, we need all the reminders of kindness for all Beings we can get. I would call you a Tree Angel, Ann. Glad to hear that the surgery went well – we need your strong knees at this dark time in the world. Gratitude for such simple yet effective words and actions. It’s wonderful to learn that you literally had a hand in making that sign. Those trails were one of the main reasons I moved here back in 2001. Thank you from the bottom of my heart and soul and soles for your stewardship! I live in a suburban cul-de-sac where the small green space, fondly called Dandelion Park, is regularly visited by the local daycare and neighborhood children. It is bordered by ash and spruce trees. On occasion I notice children climbing limbs not large or strong enough to withstand their weight and exuberance. Like you, I have asked them to be careful, to not hurt them. Just last week, I noticed a torn limb. Not sure how this happened and it hurt to see it. A few days later, driving home from work, I saw some young girls tugging on it and asked them to please stop, to wait until it was properly trimmed off, so as not to hurt it further. As I read, I’m happy to know I’ve borrowing a page from your book, Ann. Too, to read that you are recovering from your surgery and returning to your beloved medicine walks and forest tending. Thank you. Much love. What a great story Ann – how lovely to see with your own eyes the good effects of your loving thoughtfulness all those years ago. Great trees everywhere do indeed need our stewardship. The moments there are sacred, thanks to you and your stewardship. Wonderful Ann. Such a beautiful title to be a ‘trail steward’ as well as a ‘keeper of trees’ and a person extraordinaire.